The present invention generally relates to heteroaryl substituted aminopyridine compounds useful as kinase inhibitors, including the modulation of IRAK-4. Provided herein are heteroaryl substituted aminopyridine compounds, compositions comprising such compounds, and methods of their use. The invention further pertains to pharmaceutical compositions containing at least one compound according to the invention that are useful for the treatment of conditions related to kinase modulation and methods of inhibiting the activity of kinases, including IRAK-4 in a mammal. Toll/IL-1 receptor family members are important regulators of inflammation and host resistance. The Toll like receptor (TLR) family recognizes molecular patterns derived from infectious organisms including bacteria, fungi, parasites, and viruses (reviewed in Kawai, T. et al., Nature Immunol., 11:373-384 (2010)). Ligand binding to the receptor induces dimerization and recruitment of adaptor molecules to a conserved cytoplasmic motif in the receptor termed the Toll/IL-1 receptor (TIR) domain. With the exception of TLR3, all TLRs recruit the adaptor molecule MyD88. The IL-1 receptor family also contains a cytoplasmic TIR motif and recruits MyD88 upon ligand binding (reviewed in Sims, J. E. et al., Nature Rev. Immunol., 10:89-102 (2010)). Members of the IRAK family of serine/threonine kinases are recruited to the receptor via interactions with MyD88. The family consists of four members. Several lines of evidence indicate that IRAK4 plays a critical and non-redundant role in initiating signaling via MyD88 dependent TLRs and IL-1R family members. Structural data confirms that IRAK4 directly interacts with MyD88 and subsequently recruits either IRAK1 or IRAK2 to the receptor complex to facilitate downstream signaling (Lin, S. et al., Nature, 465:885-890 (2010)). IRAK4 directly phosphorylates IRAK1 to facilitate downstream signaling to the E3 ubiquitin ligase TRAF6, resulting in activation of the serine/threonine kinase TAK1 with subsequent activation of the NFκB pathway and MAPK cascade (Flannery, S. et al., Biochem. Pharmacol., 80:1981-1991 (2010)). A subset of human patients was identified who lack IRAK4 expression (Picard, C. et al.,Science, 299:2076-2079 (2003)). Cells from these patients fail to respond to all TLR agonists with the exception of TLR3 as well as to members of the IL-1 family including IL-113 and IL-18 (Ku, C. et al., J. Exp. Med., 204:2407-2422 (2007)). Deletion of IRAK4 in mice results in a severe block in IL-1, IL-18 and all TLR dependent responses with the exception of TLR3 (Suzuki, N. et al., Nature, 416:750-754 (2002)). In contrast, deletion of either IRAK1 (Thomas, J. A. et al., J. Immunol., 163:978-984 (1999); Swantek, J. L. et al., J. Immunol., 164:4301-4306 (2000) or IRAK2 (Wan, Y. et al., J. Biol. Chem., 284:10367-10375 (2009)) results in partial loss of signaling. Furthermore, IRAK4 is the only member of the IRAK family whose kinase activity has been shown to be required for initiation of signaling. Replacement of wild type IRAK4 in the mouse genome with a kinase inactive mutant (KDKI) impairs signaling via all MyD88 dependent receptors including IL-1, IL-18 and all TLRs with the exception of TLR3 (Koziczak-Holbro, M. et al., J. Biol. Chem., 282:13552-13560 (2007); Kawagoe, T. et al., J. Exp. Med., 204:1013-1024 (2007); and Fraczek, J. et al., J. Biol. Chem., 283:31697-31705 (2008)). As compared to wild type animals, IRAK4 KDKI mice show greatly reduced disease severity in mouse models of multiple sclerosis (Staschke, K. A. et al., J. Immunol., 183:568-577 (2009)), rheumatoid arthritis (Koziczak-Holbro, M. et al., Arthritis Rheum., 60:1661-1671 (2009)), atherosclerosis (Kim, T. W. et al., J. Immunol., 186:2871-2880 (2011) and Rekhter, M. et al., Biochem. Biophys. Res. Comm., 367:642-648 (2008)), and myocardial infarction (Maekawa, Y. et al., Circulation, 120:1401-1414 (2009)). As described, IRAK4 inhibitors will block all MyD88 dependent signaling. MyD88 dependent TLRs have been shown to contribute to the pathogenesis of multiple sclerosis, rheumatoid arthritis, cardiovascular disease, metabolic syndrome, sepsis, systemic lupus erythematosus, inflammatory bowel diseases including Crohn’s disease and ulcerative colitis, autoimmune uveitis, asthma, allergy, type I diabetes, and allograft rejection (Keogh, B. et al., Trends Pharmacol. Sci., 32:435-442 (2011); Mann, D. L., Circ. Res., 108:1133-1145 (2011); Horton, C. G. et al., Mediators Inflamm., Article ID 498980 (2010), doi:10.1155/2010/498980; Goldstein, D. R. et al., J Heart Lung Transplant., 24:1721-1729 (2005); and Cario, E., Inflamm. Bowel Dis., 16:1583-1597 (2010)). Oncogenically active MyD88 mutations in diffuse large B cell lymphomas have been identified that are sensitive to IRAK4 inhibition (Ngo, V. N. et al., Nature, 470:115-121 (2011)). Whole genome sequencing also identified mutations in MyD88 associated with chronic lymphatic leukemia suggesting that IRAK4 inhibitors may also have utility in treating leukemia (Puente, X. S. et al., Nature, 475:101-105 (2011)). In addition to blocking TLR signaling, IRAK4 inhibitors will also block signaling by members of the IL-1 family. Neutralization of IL-1 has been shown to be efficacious in multiple diseases including gout; gouty arthritis; type 2 diabetes; auto-inflammatory diseases including Cryopyrin-Associated Periodic Syndromes (CAPS), TNF Receptor Associated Periodic Syndrome (TRAPS), Familial Mediterranean Fever (FMF), adult onset stills; systemic onset juvenile idiopathic arthritis; stroke; Graft-versus-Host Disease (GVHD); smoldering multiple myeloma; recurrent pericarditis; osteoarthritis; emphysema (Dinarello, C. A., Eur. J. Immunol., 41:1203-1217 (2011) and Couillin, I. et al., J Immunol., 183:8195-8202 (2009)). In a mouse model of Alzheimer’s disease, blockade of IL-1 receptor improved cognitive defects, attenuated tau pathology and reduced oligomeric forms of amyloid-β (Kitazawa, M. et al., J. Immunol., 187:6539-6549 (2011)). IL-1 has also been shown to be a critical link to adaptive immunity, driving differentiation of the TH17 effector T cell subset (Chung, Y. et al., Immunity, 30:576-587 (2009)). Therefore, IRAK4 inhibitors are predicted to have efficacy in TH17 associated diseases including multiple sclerosis, psoriasis, inflammatory bowel diseases, autoimmune uveitis, and rheumatoid arthritis (Wilke, C. M. et al., Trends Immunol., 32:603-661 (2011)). WO2013/106612, WO2013/106614, WO2013/106641, WO2014/074657, and WO2014/074675 disclose substituted pyridyl compounds useful as kinase inhibitors, including the modulation of IRAK4. In view of the conditions that may benefit by treatment involving modulation of protein kinases, it is immediately apparent that new compounds capable of modulating protein kinases such as IRAK-4 and methods of using these compounds could provide substantial therapeutic benefits to a wide variety of patients. The present invention relates to a new class of heteroaryl substituted aminopyridine compounds found to be effective inhibitors of protein kinases including IRAK-4. These compounds are provided to be useful as pharmaceuticals with desirable stability, bioavailability, therapeutic index, and toxicity values that are important to their drugability. Gardner, D. S.; Santella, J. B.; Paidi, V. R.; Wu, H.; Duncia, J. V.; Nair, S. K.; Hynes, J. (BMS, USA). Heteroaryl Substituted Aminopyridine Compounds. PCT Int. Appl. WO/2016/210034 A1, 2016. 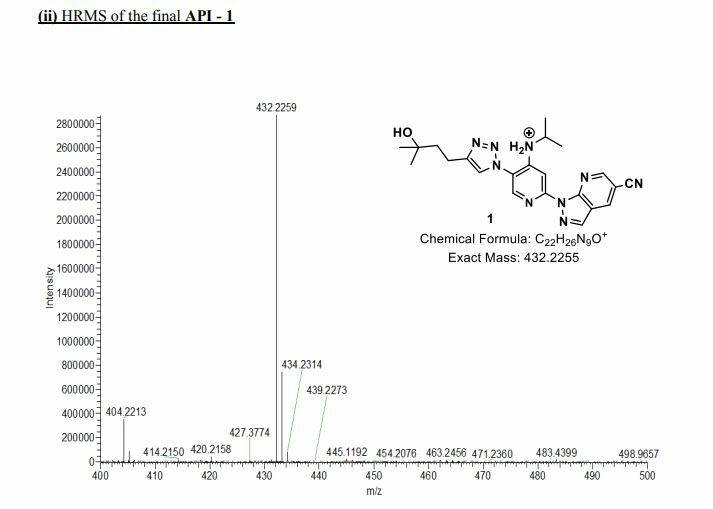 A scalable route to 1-(5-(4-(3-hydroxy-3-methylbutyl)-1H-1,2,3-triazol-1-yl)-4-(isopropylamino)pyridin-2-yl)-1H-pyrazolo[3,4-b]pyridine-5-carbonitrile (1, BMS-986236) was developed by incorporating an alternate azide intermediate following safety-driven processes. The newly developed process involved mitigating safety hazards and eliminating the column chromatography purification. The issue of trace metal contamination in the final API observed in the first-generation synthesis has been overcome. 1 (92.5 g, 73% yield, 99.5% purity by HPLC) as a cream-colored solid. 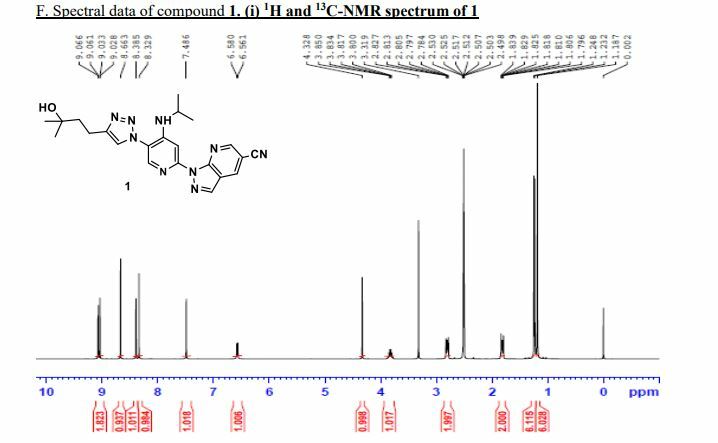 1H NMR (400 MHz, DMSO-d6) δ = 9.21–8.86 (m, 2H), 8.66 (s, 1H), 8.45–8.24 (m, 2H), 7.49 (s, 1H), 6.57 (d, J = 7.5 Hz, 1H), 4.33 (s, 1H), 3.83 (d, J = 7.0 Hz, 1H), 2.91–2.72 (m, 2H), 1.97–1.68 (m, 2H), 1.24 (d, J = 6.5 Hz, 12H). 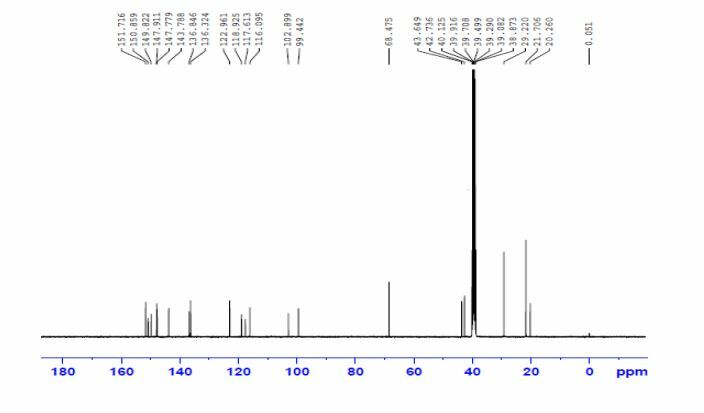 13C NMR (100 MHz, DMSO) δ = 151.7, 150.8, 149.8, 147.9, 147.7, 143.7, 136.8, 136.3, 122.9, 118.9, 117.6, 116.0, 102.8, 99.4, 68.4, 43.6, 42.7, 29.2, 21.7, 20.2. HRMS [M + H]+ calcd for C22H25N9O 432.2255, found 432.2259.